Russian Venus probe. The 1VA probe, the first spacecraft sent towards Venus, consisted of a cylindrical body topped by a dome, totaling 2 meters in height. AKA: 1VA. Status: Operational 1961. First Launch: 1961-02-04. Last Launch: 1961-02-12. Number: 2 . Gross mass: 644 kg (1,419 lb). Two solar panels extended radially from the cylinder. A large (over 2 meter diameter) high-gain net antenna was used to receive signals from the ground. This antenna was attached to the cylinder. A long antenna arm was used to transmit signals to Earth. The probe was equipped with scientific instruments including a magnetometer attached to the end of a 2 meter boom, ion traps, micrometeorite detectors, and cosmic radiation counters. The dome contained a pressurized sphere which carried a Soviet pennant and was designed to float on the putative Venus oceans after the intended Venus impact. Venera 1 had no on-board propulsion systems. Temperature control was achieved with thermal shutters. Family: Venus. Country: Russia. Engines: KDU-414. Launch Vehicles: R-7, Molniya 8K78. Projects: Venera. Launch Sites: Baikonur, Baikonur LC1. Agency: Korolev bureau. Bibliography: 2, 296, 376, 6, 64, 65, 7015. 1961 February 4 - . 01:18 GMT - . Launch Site: Baikonur. Launch Complex: Baikonur LC1. LV Family: R-7. Launch Vehicle: Molniya 8K78. FAILURE: At T+531 sec, the fourth vernier chamber of Stage 3's 8D715K engine exploded because the LOX cut-off valve had not closed as scheduled and LOX flowed into the hot chamber.. Failed Stage: U.
Sputnik 7 - . Payload: 2MV-2 s/n 1. Mass: 6,483 kg (14,292 lb). Nation: Russia. Related Persons: Glushko, Korolev. Agency: RVSN. 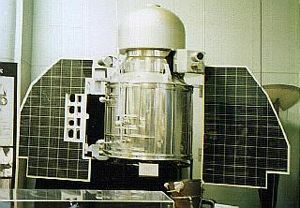 Program: Venera. Class: Venus. Type: Venus probe. Spacecraft Bus: 1MV. Spacecraft: Venera 1VA. Decay Date: 1961-02-26 . USAF Sat Cat: 71 . COSPAR: 1961-Beta-1. Apogee: 318 km (197 mi). Perigee: 212 km (131 mi). Inclination: 64.90 deg. Period: 89.80 min. The escape stage entered parking orbit but the main engine cut off just 0.8 s after ignition due to cavitation in the oxidiser pump and pump failure.. The payload attached together with escape stage remained in Earth orbit. The booster launched into a beautiful clear sky, and it could be followed by the naked eye for four minutes after launch. The third stage reached earth parking orbit, but the fourth stage didn't ignite. It was at first believed a radio antenna did not deploy from the interior of the stage, and it did not receive the ignition commands. Therefore the Soviet Union has successfully orbited a record eight-tonne 'Big Zero' into orbit. The State Commission meets two hours after the launch, and argues whether to make the launch public or not, and how to announce it. Glushko proposes the following language for a public announcement: 'with the objective of developing larger spacecraft, a payload was successfully orbited which provided on the first revolution the necessary telemetry'. Korolev and the others want to minimize any statement, to prevent speculation that it was a reconnaissance satellite or a failed manned launch. Kamanin's conclusion - the rocket didn't reach Venus, but it did demonstrated a new rocket that could deliver an 8 tonne thermonuclear warhead anywhere on the planet. The commission heads back to Moscow. 1961 February 5 - . Venera failure announcement - . Nation: Russia. Program: Vostok. Flight: Vostok 1. Spacecraft Bus: 1MV. Spacecraft: Venera 1VA. Tass announces launch of a new 'Heavy Sputnik' - the cover finally agreed by the leadership for the failed Venera launch..
1961 February 12 - . 00:34 GMT - . Launch Site: Baikonur. Launch Complex: Baikonur LC1. LV Family: R-7. Launch Vehicle: Molniya 8K78. Venera 1 - . Payload: 1VA s/n 2, Venera 1 (Sputnik 8, AMS). Mass: 644 kg (1,419 lb). Nation: Russia. Related Persons: Korolev. Agency: RVSN. Program: Venera. Class: Venus. Type: Venus probe. Spacecraft Bus: 1MV. Spacecraft: Venera 1VA. USAF Sat Cat: 80 . COSPAR: 1961-Gamma-1. Underway to Venus - . Nation: Russia. Related Persons: Keldysh, Khrushchev, Korolev. Program: Vostok. Flight: Vostok 1. Spacecraft: Venera 1VA, Vostok. Korolev says the Venera flight continues normally. He and Keldysh will fly to Yevpatoriya tomorrow to review long-range communications with the spacecraft. After the launch he and Keldysh talked to Khrushchev, who was very happy with the success. Meanwhile, the Vostok for the next flight attempt has arrived at Tyuratam. Launch is set for 24-25 February.